There is a well developed literature on the development of vocabulary and grammar in children with Down syndrome but limited information in the area of speech production. The spoken language of people with Down syndrome often leads to a lack of intelligibility which does not necessarily diminish with age, despite slow but steady development of phonology. This paper explores some of the elements in speech production which may contribute to the listeners' perception of reduced intelligibility in the speech of people with Down syndrome. There is a general consensus that speech difficulties are common in individuals with Down syndrome and that these consist of a complex interweave of phonological and motor-speech delay and deviance. Phonological immaturities such as final consonant deletion, use of stops for fricatives, producing voiced for voiceless sounds and vice versa are common. Many studies have suggested the pattern of speech delay to be similar to that of young developmentally typical children. This may be an over-simplistic view of the situation. Roberts et al. found additional systematic errors not previously reported, for example palatal fronting, fricative simplification, deaffrication, and lateralisation of sibilants. Dodd and Thompson clearly show that children with Down syndrome are inconsistent in speech production, with over half of all words produced being pronounced differently on repeated productions. Variability is also reported in the articulation of fricatives by young people with Down syndrome. Speech can be analysed in terms of its segmental structure (the precision and appropriateness of the sequences of sounds produced), or its suprasegmental aspects (intonation, rhythm, stress, voice). Studies undertaken by Bray and associates indicate that there may be suprasegmental differences which appear to be associated with problems of identifying and signalling word and phrase boundaries[6,7,8]. For some of the people with Down syndrome studied, word and phrase endings were better articulated and carried more stress than the initial syllable or the head of the tone group. This is contrary to typical speech in English where the first syllable in a disyllabic word and the initial sentence position carries the higher stress. Syllable deletion is common in the speech of people with Down syndrome and Heselwood, Bray and Crookston have suggested that syllable deletion allows for simplification of the rhythmic structure of the utterance, making the neurophysiological process of speaking easier. Links between production and perception need to be considered as Pettinato and Verhoeven show that perception of weak syllables is problematic in adolescents with Down syndrome. Dysfluency (stuttering) is the inability to move forward in the utterance because of repetitions of a sound, syllable or word, prolongations of sounds or of silence and tense pauses (both filled and unfilled) associated often with obvious struggle to produce the word. The issue of whether the dysfluencies of people with Down syndrome can be defined as stuttering is unresolved as the definition includes more than just overt speech behaviors (levels of awareness, anxiety and avoidance form part of the stuttering syndrome). The literature on dysfluency in people with Down syndrome suggest a much higher incidence than in the general population (47% as against 1%[10,11]). Dysfluency can add to the lack of intelligibility in speakers and adds another level of difficulty in the production of speech by children with Down syndrome. Berstein Ratner suggests that, in typically developing children, dysfluency is related to language processing. As grammatical morphemes are rapidly expanding, children find the processing load significantly higher and a breakdown in fluency can result. Bray, in a study of two young dysfluent children with Down syndrome, found that the dysfluencies did not show a definite relationship to word finding problems and that the nature of the speech output consisted of complex patterns of interjection of sounds, production of non-English sounds (clicks) and, in addition, changes in prosodic features such as increased durations of sounds, sudden pitch changes and numerous filled and unfilled pauses. These speech difficulties were also identified by Heselwood in a young dysfluent man with Down syndrome who used clicks (found in African languages) seemingly as a result of involuntary dorso-velar closure while attempting sonorant productions. This suggests a motor-speech difficulty rather than/ as well as a linguistic programming problem. What could be applied in intervention? Making direct connections between theory and practice is complicated by the complexity of the speech problems. Unintelligibility is a problem often mentioned by those who live and work with people with Down syndrome. It is related to both sentence construction and the segmental and suprasegmental levels of speech as well as to the listeners' perception and expectations. It is important therefore to (a) find ways of enhancing the message giving by the person with Down syndrome and (b) improve the 'listening' and awareness of the communication partner. There is also a growing literature showing that cognitive and affective factors have a strong influence on the planning and production of speech. This suggests that a relaxed, at ease, dialogue is far more likely to be understood by both parties than one where one or both partners in the exchange is anxious. 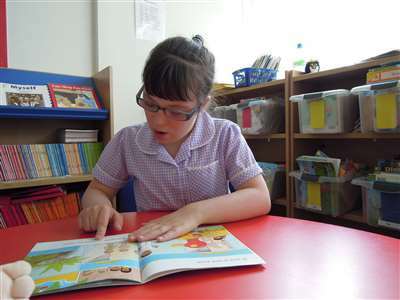 The work of Wishart alerts us to the necessity of understanding the learning styles of children with Down syndrome and ensuring that the learning environment is facilitative. In the stuttering literature, the importance of keeping a balance between the child's capacities in language and cognition and the performance demands made on that child is seen as highly significant in maintaining fluency. This is known as The Demands and Capacities model. A holistic approach which supports the child in any attempt at communication - thus reducing the demands on a fragile speech-motor system. Training in careful listening should precede any production attempts as speech perception is important in the laying down of linguistic and motor processes in the brain. Training of others in identifying and understanding the speech patterns of children with Down syndrome in order to enhance the message detection ability of listeners. The use of simple rhythms to improve both fluency and sequencing difficulties (clapping of syllables of multisyllable words or short phrases). The use of visual and tactile prompts for the placement of speech articulators in order to reduce the auditory memory load. A focus on teaching speech and fluency in single functional words or simple phrases through parent support and education. van Borsel, J. Articulation in Down's syndrome adolescents and adults. European Journal of Disorders of Communication. 1996;31:415-444. Dodd B, Thompson L. Speech disorder in children with Down's syndrome. Journal of Intellectual Disability Research. 2001;45:308-316. Timmins C, Hardcastle W, Wood S, McCann J, Wishart J. Variability in fricative production of young people with Down's syndrome: An EPG analysis. International Congress of Phonetic Sciences. 2007;XVI:1981-1984. Heselwood B. A case of nasal clicks for target sonorants: a feature geometry account. Clinical Linguistics and Phonetics. 1995;11;42-61. Jansen W, Bray M. (ongoing) Exploring the speech of a young child with Down syndrome. Pettinato M, Verhoevan J. Production and perception of word stress in children and adolescents with Down syndrome. Down Syndrome Research and Practice. Manuscript submitted. Preus A. Stuttering in Down's syndrome. In: Lebrun Y, Hoops R, editors. Neurolinguistic Approaches to Stuttering. The Hague: Mouton;1973. Devenny D, Silverman W. Speech dysfluency and manual specialization in Down's syndrome. Journal of Mental Deficiency Research. 1990;34:253-260. Bernstein Ratner N. Stuttering: a psycholinguistic perspective. In: Curlee RF, Siegel GM, editors. The Nature and Treatment of Stuttering: New Directions. 2nd edition. Boston: Allyn and Bacon. 1997:p.99-126. Bray M. Language and dysfluency in two young children with Down syndrome. Conference paper. International Fluency Association. Dublin;2006. Kumin L. Intelligibility in speech in children with Down syndrome. Parents' perspective. Perceptual and Motor Skills. 1994;78:307-313. Ludlow C, Loucks T. (2003) Stuttering: a dynamic motor control disorder. Journal of Fluency Disorders. 2003;28:273-295. Wishart J. Learning in young children with Down's syndrome: Developmental trends. In: Rondal J, Perera J, Nadel L, Comblain A, editors. Down's Syndrome. Psychological, Psychobiological and Socio-educational Perspectives. London: Whurr;1996. p.81-98. Starkweather CW, Gottwald SR. The demands and capacities model II: Clinical application. Journal of Fluency Disorders. 1990;15,143-157. Dodd B, McCormack P, Woodyatt G. Training parents of children with Down syndrome as agents of therapy. In: Dodd B, editor. Differential Diagnosis and Treatment of Children with Speech Disorder. London: Whurr;1995. p.249-261.